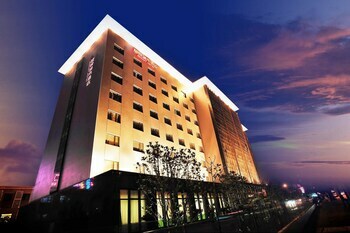 With a stay at Benjoy Hotel - Jinqiao Branch in Shanghai (Pudong), you'll be within a 15-minute drive of Shanghai Zhangjiang Hi-Tech Park and Oriental Art Center. Featured amenities include complimentary newspapers in the lobby, a 24-hour front desk, and luggage storage. Event facilities at this hotel consist of a conference center and a meeting room. Free self parking is available onsite. With a stay at Dengfeng Taiyuan Hotel in Zhengzhou, you'll be 3.7 mi (5.9 km) from Fawang Temple Pagoda and 6.1 mi (9.7 km) from Mount Song. Free self parking is available onsite.